Does expanding your aviation horizons by mastering more than one engine appeal to you? Let Jeppesen help you achieve your goal of a multi-engine rating with the Jeppesen Multi-Engine Pilot Training Kit. 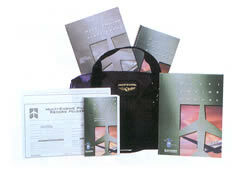 Jeppesen Multi-Engine Training Kits, developed for both FAR Part 61 and FAR Part 141 training programs, are the most complete multi-engine training packages available. Keep enroute charts organized with this accordian fold Jeppesen Chart Wallet.